This collection of stories selected from ONE WAY OR ANOTHER and FAR-FLUNG also includes two previously uncollected stories: Departing, first published in The Yale Review and the basis for the novel THE WEEKEND, and Aria, also published in The Yale Review. THE HALF YOU DON'T KNOW was published by Plume in 1998, and is now out of print. The author's first book, a collection of stories. A second collection of stories published in 1991. A collection of stories selected from ONE WAY OR ANOTHER and FAR-FLUNG. Page includes a complete list of published stories, 1982 to the present. The author's second book and first novel, written as serial novel for 7 DAYS magazine in 1988. The author's second novel, published in 1994. The author's third novel, published in 1997. 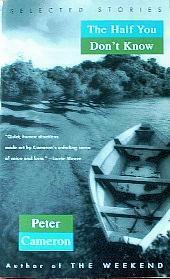 The author's fourth novel, published in May 2002. A novel published by Farrar, Straus & Giroux in September 2007. A new novel, published by FSG in March 2012.